One gorgeous sunny day last fall I was set up at an informational table as a representative of the FIC (Fellowship for Intentional Community). This was at the annual community open house event put on by the local ecovillage. Since my table was located right near the entrance I got to be one of the first people to interact with the hundreds of guests who came out for the event. Some were neighbors or people who had been to the open house in years prior, but most were folks who had never before traveled to the area and were seeing it all with fresh eyes. Quite often that day, as people milled about waiting for their scheduled tours to begin, I found myself engaged in conversations many of which focused on people wanting information on setting up an intentional community back at home where they lived. Some already had land available for such a project, others had a core group of interested friends, some had a well-developed vision of what the as-yet-unformed community would one day become, and a few special folks had all those things but were still unsure where to go from there. I genuinely enjoy listening to people talk about their visions for community life, and often I find myself in situations where I am given the opportunity to pass on knowledge and wisdom stemming from my involvement in community. 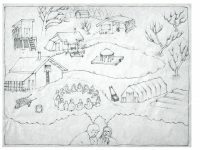 As a cofounder of a 10-year-old intentional community (ours focuses on homesteading) I have insights into what some of the challenges can be and lots of empathy for people who are going through the start-up phases of setting up a community, seeking one to join, or trying to decide if they want to join one that’s already in existence or begin one of their own. I want to share my perspectives with others so they can avoid pitfalls and hopefully learn from my experiences. Setting up a legal entity, figuring out financing, having a committed core group, preventing overwhelm and burnout, anticipating population turnover, and dealing with power dynamics are a few of the myriad topics to ponder when making the decision to launch a community venture. On the other hand, I personally have never been one to follow the usual way of doing things—or even my own retrospective advice. I am a peace-loving rebel at heart, and after limited experience of a few days visiting one ecovillage in the US and a handful of eco-farms in Central America I decided to join a group of three other people in creating our own intentional community. At the time we were starting it certainly felt like the right thing to do because no other community we knew of embodied enough of the values we were holding to be a good fit, we wanted to be located in a particular geographical area, and we figured that it really would be an attractive community model for others in the future. We were visionaries with pioneering spirits and a lot of dreams and excitement, so we took the plunge and decided to become community founders. We spent many hours together clarifying our vision and mission statements as well as researching how to set up the legal entity. The book Creating a Life Together by Diana Leafe Christian proved to be a great jumping-off point. After examining our legal options we eventually settled on establishing a community land trust corporation. 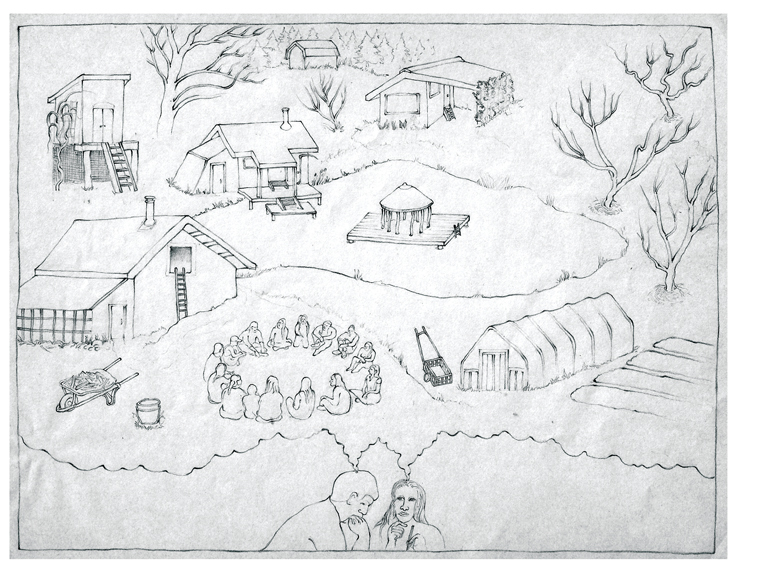 We then spent many more hours poring over the bylaws, articles of incorporation, and lease documents from sources we could scrounge up—other intentional communities or land trusts that had been similarly established. We took bits from many sources, as well as some of our own original input, to eventually craft our founding documents; upon completion we showed them to a kind lawyer knowledgeable about intentional communities who recommended a few tweaks. It seemed that our number of four founders was probably the bare minimum to successfully handle such an undertaking. It was a struggle at times not to feel burned out or overwhelmed with all the details. And when life kept us busy, progress on the technical aspects moved at a snail’s pace. Although having a smaller group was probably conducive to more easefully crafting a workable combined vision, having a larger group would have helped to spread out the burden of all the research and wordsmithing. Part of our research involved finding possible sites in our area on which we could develop the community. Cold-calling names listed on a county plat map resulted in success—a local landowner agreed to sell his tract of pasture land at a reasonable cost. But although the four of us came with some savings, our pooled money would cover only about a third of the purchase price. Choosing how to finance the rest was another somewhat complicated process for us. We contemplated a few different loan options and also the possibility of recruiting other founder-investors. We finally negotiated borrowing from a friendly acquaintance who, although he did not want to join as a member of the community, had definite attachments and opinions on what we should be doing which at times was tricky to navigate. We pushed forward and got things settled to buy the land. We celebrated and began camping on the property. Life progressed until the next little bump in the road for me personally as well as our newly formed community. Approximately three months after we purchased the land, one of the founders decided to leave. He and I had been involved romantically for over four years and as our romantic relationship declined he recognized that he needed to move on and travel to other places. So among other challenges of that time, this also meant our forming community had lost a quarter of its membership during this delicate beginning phase. Most intentional communities are familiar with the concept of a high turnover rate in population. It was not surprising that someone would choose to leave and more people would come in as residents. There were folks who had not been part of the visioning stage but who were there with us early on. Each time it was a learning experience. Our first new resident was a charismatic guy who was going through a break-up and had kids in the area for whom he shared parenting responsibilities. He was friends with us and we were wanting more people to join. Although not a perfect values match it seemed like it would work out beneficially for all. The membership group gave approval for him to construct a “tiny house” on the property as well as a small shed and some animal housing. After some months as a resident he then decided to move on. In the beginning we had not foreseen all the possible complications that could arise with such a situation. Things eventually worked out fine; however, our experience with this resident and the structures he left behind led us to come up with some policy norms that we didn’t have in place prior to that. Namely: a person has to be a resident on the land for six months before becoming a member, and during that time the expectation is that they will not make any permanent changes to the land or construct permanent dwellings (we have made rare exceptions to this by full group consensus). Also, when an individual or family begins camping on unleased land, they are to pay a monetary deposit to help ensure that the site gets satisfactorily remediated in the event of their departure. One topic that has come up with the advent of additional people in the community is the power imbalance that exists between members and residents. For our group, this dynamic is something to acknowledge and simply accept as unavoidable as part of the process of creating a functional and healthy community. The understanding is that this power imbalance exists as a temporary phase while the community and resident get to know and trust one another. It can help ease relationships if the existing members make a concentrated effort to integrate and support new residents rather than leave them flailing on their own feeling isolated. We’ve tried our best to do this by appointing each resident a liaison to the community and by offering to help the residents organize work-parties for settling in or tackling projects that seem daunting. We set aside time in our meetings to have a resident check-in with the full group at least once a month to provide space and a scheduled format to address any issues that arise. To a lesser degree an imbalance of power also exists between founders and those who join later. Members who did not help to craft the founding vision will perhaps be holding some different core values or ideal ways of being together in community. The default will be the position of what has come before, and once a rule or norm has been instated it can take substantial effort to create a change. Though not impossible, it takes a lot of momentum to shift the status quo, and it can feel like an uphill battle—that those who crafted the vision have their desires incorporated into the basic structure of the community, and those who join later hold valid and useful preferences which are not necessarily upheld by community norms. Therefore it can be very helpful to make certain from the outset that both the current community norms and the longer-term community vision are explicitly communicated to incoming visitors, residents, and members so as to make sure everyone is clear about what they might be getting into. And how do we attract those new people best suited for joining the community? That is a question that nearly all communities wrestle with at some point. In fact it is one that I continue to spend a fair amount of thought energy on even now. “If you build it they will come” only goes so far. Getting people involved who have a propensity for networking can come in handy. Listing with the FIC Directory, creating an attractive website, and using social media can be great. There are conferences to attend and a multitude of ways to get the word out. When contacted by community seekers I ask them pointed questions to attempt to quickly determine if their intentions are serious and if their vision would be something that could practically happen within our particular framework. At times we have been nearly overwhelmed with people wanting to live at our homestead community and at others we go an entire season without serious interest. At one point we were considered full and then about a year later we have leaseholds available again as members decide to explore other life adventures. I believe it is important to keep in mind that it is natural for a community’s population to wax and wane. I have hopes that this intentional community of ours will continue to function long after I am gone. And I know that frequently people who come for even a short visit are impacted in ways that can be life-changing. I try to keep an open mind and open heart and trust that what we are doing is making a difference. Kim Scheidt lives at Red Earth Farms in northeast Missouri at the egalitarian sub-community homestead of Dandelion. She works part-time doing accounting for the Fellowship for Intentional Community and other area nonprofits. She is excited by the ideas of simple living, feminism, spirituality, permaculture, and open communication. She can be reached via email kim [AT] ic.org. ← How do I Create Cohousing?